Having red eyes most or all of the time indicates inflammation of the eye's tissues due to irritation, infection, disease or allergy. When your eyes are red, this means blood vessels in the eye are dilated to increase blood flow to inflamed tissues. Extra blood is necessary to counter inflammation because blood carries white blood cells meant to fight inflammation. Some reasons for chronically red eyes are obvious, such as seasonal allergies, colds, influenza and conjunctivitis (pink eye). Other reasons may not be obvious because symptoms of certain eye conditions are often disregarded or attributed to something else. 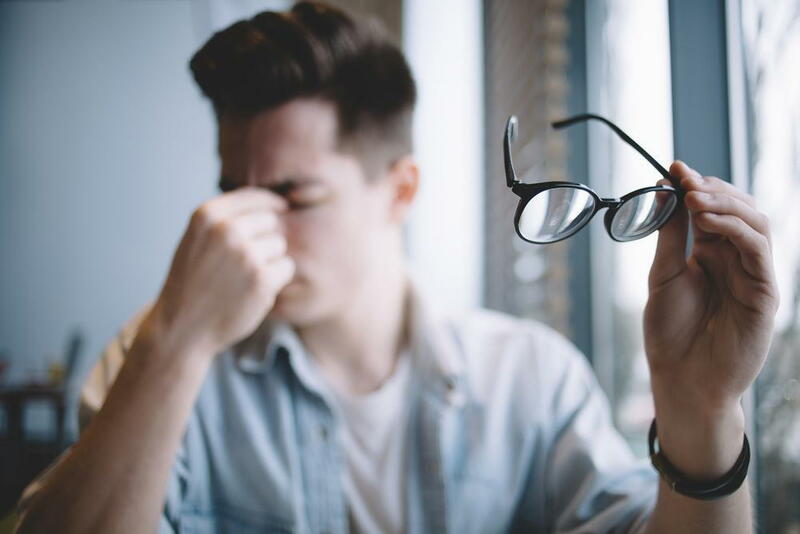 If eye fluid evaporates too quickly or is not chemically balanced enough to provide your eyes with adequate moisture, you could be suffering from dry eye syndrome. Mild dry eye may only cause symptoms occasionally, especially when you are outside, tired or haven't rested your eyes after reading for a while. In addition to redness, other signs of dry eye include having a gritty, burning sensation in your eyes, blurry vision, eyelids that feel heavy or sticky and nighttime eye discharge. If you wear contact lenses, you may find it difficult to wear them without experiencing eye irritation or pain. Treatment for dry eye syndrome depends on what is causing the lack of eye fluids. Sometimes lubricating eye drops help reduce eye redness and dryness. Other treatments involve a minimally invasive laser procedure meant to increase fluid levels in the eyes. Commonly diagnosed in people over 50, blepharitis is inflammation of the eyelashes and eyelids due to accumulation of oils, debris or bacteria. Signs of blepharitis include red eyes, burning, itching, crusting of the eyelids, eyelash "dandruff" and eye redness. Severe cases of blepharitis may swell eyelids and make it difficult to see. Cleaning your eyelids and eyelashes thoroughly may help resolve blepharitis but most people need to visit their eye doctor for a professional eyelid "scrub" to remove dirt and oils. Health problems such as high blood pressure and diabetes may also cause chronically red eyes by causing damage to ocular blood vessels. Disorders affecting your circulatory system can also negatively impact blood vessels in your eyes. To determine why you have red eyes, your optometrist will perform a comprehensive eye exam and refer you to a specialist if needed. If you have chronically red eyes, please schedule an appointment at Wichita Optometry, P.A. today by calling (316) 942-7496.